Estimating the economic value of trade in CITES species can strengthen the case for incentive driven management and sustainable use by making the contribution to national economies and livelihoods more explicit. The monetary value of EU imports of CITES-listed animal species is estimated in this section. To calculate the value of relevant 2012 imports to the EU, we use a methodology first developed by UNEP-WCMC for the 2010 Analysis, and also used for the 2011 Analysis. In this year’s analysis, the same methodology was used for the first time to estimate the economic value of exports and re-exports of CITES-listed animals by the EU. The value of EU imports of CITES-listed animals in 2012 (excluding caviar extract) was estimated at USD727 million (~EUR537 million), whereas the value of EU exports (including re-exports) was estimated to be 70% higher at approximately USD1.2 billion (~EUR0.89 billion). The most valuable import commodities were leather products and skins; luxury items also made up a high proportion of export value, including leather products, garments and caviar. In the CITES context, trade in wild and ranched CITES-listed animals to the EU in 2012 was likely to be economically important for the top ten exporters by value (estimated to be over USD4 million each). 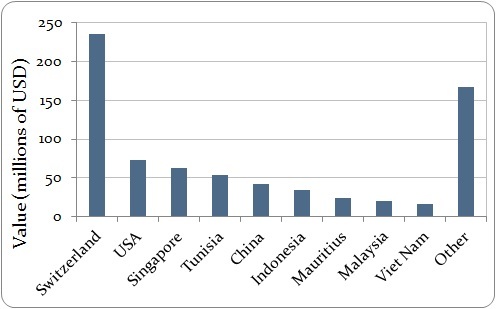 Six of these countries are “megadiversity” countries; however, aside from Indonesia and Australia (both of which exported >100 taxa in 2012), the estimated economic value for other top exporting countries was derived from relatively few taxa. To estimate the value of EU trade in CITES-listed animals, species-specific values in United States dollars (USD) that are included in the United States annual report to CITES (as transmitted by the United States Fish and Wildlife Service) were used for calculations. The median value for each family/term/unit/source combination, corrected for inflation, was multiplied by the corresponding EU-reported trade volume (as recorded in the CITES Trade Database) to obtain a total value for CITES-listed EU imports and exports in 2012. In cases where there was an insufficient sample size to calculate a reliable value for the family/term/unit/source combination, a suitable proxy was used (e.g. order instead of family, or an alternative term or source); in cases where no suitable proxy could be found, the data were excluded. Whilst the exclusion of some trade records will reduce the overall estimated value of EU trade, other median values that are high but are based on a lower number of records (e.g. five to ten) may have the effect of exaggerating the value importance of certain taxa. Overall figures should therefore be interpreted with some caution. Further details of the methodology, along with caveats to this approach, can be found here. Results are initially presented exclusive of caviar extract as value estimates for this commodity may be inflated. Whilst prices for caviar extract are based on a high number of records in the United States dataset, it is unclear if the quantities reported in trade accurately represent the amount of CITES-listed extract within finished skincare products. A comprehensive valuation of EU plant imports was not undertaken as no value dataset with adequate taxonomic coverage was available at the time of analysis. Reflecting the amounts reported by traders via USFWS 3-177 forms. The monetary value of EU reported CITES-listed animal imports in 2012, excluding caviar extract, is estimated to be approximately USD727 million (USD726 700 768 or ~EUR537 million). The value of this trade appears to be increasing annually when compared to estimates for 2010 and 2011 (USD424.3 million and USD675.7 million, respectively). As in previous years, the value was dominated by reptile commodities, with trade in reptiles accounting for 73% of the value of EU animal imports in 2012, reflecting the relatively high volume of EU imports of this group. Proportion of EU value (2012 USD) of imports of animals by class in 2012. Trade in wild and ranched CITES-listed animals to the EU in 2012 accounted for USD424.7 million (~EUR313.8 million) or 58% of total estimated value, with captive-produced imports worth over USD275 million (~EUR203 million, or 38% of value). All Euro equivalent values throughout this section are based on an exchange rate of 0.738 EUR to 1 USD from http://www.xe.com/ on 17 July 2014. When comparisons to 2011 prices are used, these reflect values published in the 2011 EU Analysis of Annual Reports that are based on the same methodology used here, but use the median 2011 USD equivalent value from 2007-2011, as opposed to the 2012 USD value derived from the median of 2008-2012 United States price data. Similarly, 2010 prices are based on median values using the 2006-2010 United States price data. Annual figures for 2010 and 2011 have been corrected for inflation. 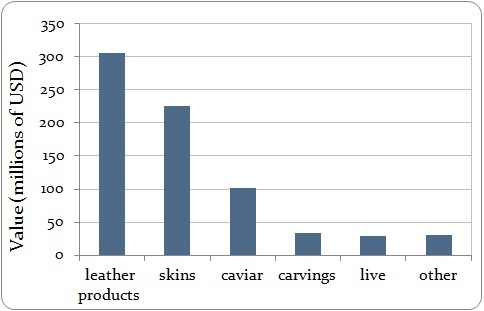 Leather products and skins were the top two commodities imported by value when excluding caviar extract, representing 42% and 31% of the overall estimated value, respectively. This mirrors findings from 2010 and 2011 and approximately reflects trade volumes, with skins and leather items the commodities imported to the EU in the largest volumes (36% and 28% of the trade recorded as number of items, i.e. without a unit, respectively). The value of the key commodities imported by the EU in 2012 is summarised in the figure below. A brief overview of each of the top five commodities based on value is provided below. Value (2012 USD) of trade in the top five commodities imported by the EU in 2012, by quantity (excluding caviar extract), with an indication of the combined value of the remaining terms (“other”). 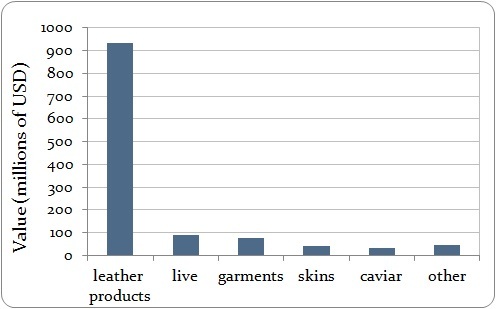 Leather products (encompassing both small and large leather products) were the top commodity imported by the EU by quantity in 2012, and represented the most valuable commodity imported into the EU in 2012 (excluding caviar extract) with an estimated value of USD306 million (~EUR226 million). Correcting for inflation, this represents an increase in value of around 9.6% compared with 2011 and 47% compared to 2010. The predominant families in trade by economic value were reptilian. Alligatoridae accounted for 67% of the EU imports of this commodity by value; Crocodylidae (14%) and Pythonidae (11%) also represented a notable proportion of estimated economic value. 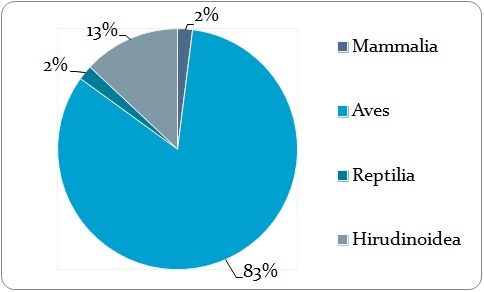 Three additional reptile families were imported in notable quantities exceeding USD1 million: Varanidae (6%), Colubridae (1%) and Teiidae (<1%). Wild-sourced leather products accounted for almost three quarters (74%; USD226.3 million or ~EUR167.2 million) of the total value of leather products, again primarily comprising the family Alligatoridae (83% of all wild-sourced leather products). Skins were the second highest commodity imported by volume and value into the EU in 2012 (excluding caviar extract). This trade was estimated to be worth over USD226 million (~EUR167 million), with reptiles representing the majority of the estimated value (92%) and mammals comprising virtually all of the remainder. The estimated value of skin imports in 2012 was around 7% higher than the value estimated for 2011 skin imports, corrected for inflation. The trade in skin pieces was estimated to be worth a further USD0.79 million (~EUR0.58 million). The three most important reptile families by estimated economic value for the skin trade in 2012 were: Alligatoridae (40%), Pythonidae (34%) and Crocodylidae (16%). Over 77% of the reptile skin trade by value was dominated by only five species, in order of importance: Alligator mississippiensis, Python reticulatus, P. bivittatus, Crocodylus niloticus and C. porosus. Over half (51%) of all reptile skin imports by value were wild-sourced, and worth an estimated USD106.5 million (~EUR78.6 million), mainly comprising Alligatoridae. A similar proportion (43%) were from captive sources (comprising Pythonidae and Crocodylidae) and were estimated to be worth USD91 million (~EUR67million), with ranched skins (virtually all Crocodylidae) worth approximately USD10 million (~EUR7.4 million). The price of skins in trade was affected by the source of the specimens; the median value for wild-sourced Alligatoridae skins (USD236) was over three times the value of captive-produced skins (USD66) and almost six times the value of ranched skins (USD41). These prices were based on a high number of trade records for wild-sourced, captive-sourced and ranched skins (1723, 920 and 75 respectively). The value of mammal skin imports to the EU in 2012 was estimated at USD18.5 million (~EUR13.7 million). The three most important families by economic value were Felidae (42%), Canidae (34%) and Tayassuidae (20%). Caviar was the third most important commodity by value imported in 2012, and compared to 2010 and 2011, was ranked more valuable than the trade in live animals for the first time. Imports of caviar into the EU were estimated to be worth over USD102 million (~EUR75.4 million) in 2012, with over 99% of the value of caviar derived from aquaculture (sources C and F) specimens. This reflects trade volumes, with over 95% of caviar (reported in kg) originating from captive sources. The main captive-bred taxa in trade by value were Acipenser baerii (85%), Huso dauricus x Acipenser schrenckii (4%) and Acipenser transmontanus (4%). Caviar is a very low volume but high value product. The median values for captive-bred caviar for combined species of the family Aciperseridae have been comparable for the three years 2010, 2011 and 2012 in which valuation analysis has been undertaken; USD935/kg, USD936/kg and USD899/kg respectively. Comparatively, the median family value for wild-sourced caviar has declined over the equivalent years; USD1080/kg, USD882/kg and USD695 respectively. 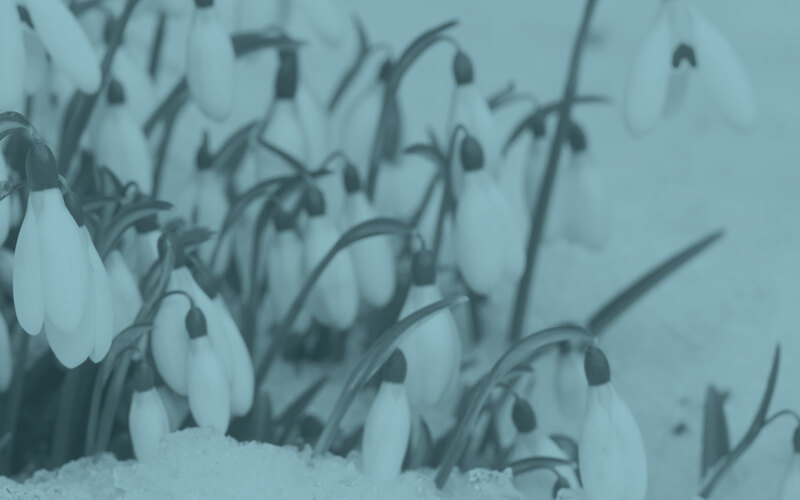 This decline may be attributed to a change in wild-sourced species imported into the EU over these years, with Acipenser gueldenstaedtii, A. stellatus and Huso huso imported in 2010 but not in subsequent years. Only wild-sourced caviar of Scaphirhynchus platorynchus was imported in 2011, with S. platorynchus and Polyodon spathula imported in 2012. Carvings (including trade reported in all units) was included in the “top five” commodities imported to the EU by value for the first time in 2012, and comprised 4.5% of the total estimated value of EU imports in 2012 (USD32.7 million or ~EUR24.2 million). Corallidae represented 39% of the value of carvings, with the majority reported as pre-Convention. The median value for pre-Convention carvings of Corallidae was USD1693 (based on 70 trade records); this is relatively high compared to the estimated value for captive-sourced carvings (USD375, based on 55 records). One species Balaenoptera acutorostrata (Minke Whale) accounted for almost 30% of the estimated value for this commodity, all of which was wild-sourced from Greenland. The predominance of whale carvings in the 2012 valuation of EU trade is largely due to the fact that the median value for carvings of wild-sourced Balaenopteridae is very high (over USD400 000, based on 5 trade records). As a comparison, the median value for pre-Convention carvings of Balaenopteridae was approximately USD15 000, although only two price records are available from the United States dataset. Live animals represented the fifth most valuable commodity and were the third highest commodity imported by volume in 2012 (reported in number of units) with over one million individual animals imported. The total estimated value of live animal imports into the EU in 2012 was over USD24 million (~EUR17.7 million). Estimated figures for the economic value of this trade indicate a decrease compared to 2011 estimates of over USD36.5 million, but are more comparable to 2010 figures of USD20 million (corrected for inflation). Whilst Anthozoa, Reptilia and Hirudinoidea dominated EU live imports (reported in number) by volume, live mammals accounted for the highest proportion (47%) by value. The approximate average value for a live mammal imported in 2012 (based on estimated family median values) was approximately USD2500, compared to around USD4-5 for a live animal of the families Hirudinoidea and Anthozoa, or USD27 for Reptilia. As in 2010 and 2011, Cercopithecidae was the predominant mammal family by value, accounting for 95% of the value attributed to live mammals (or USD10.7 million, ~EUR7.9 million). 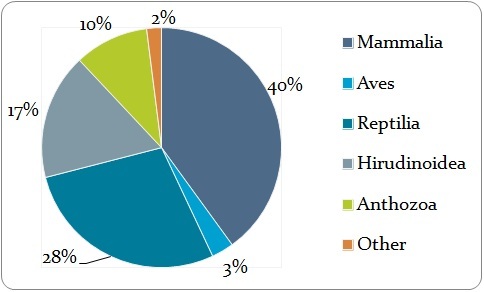 Trade was dominated by one species: Macaca fascicularis, mainly for biomedical purposes (92%). The majority of the economic value of live mammals was derived from captive-bred specimens (>99%). Trade in live reptiles accounted for 28% of live imports by value in 2012, and was valued at USD7.8 million (~EUR5.8 million). The key reptile families in trade, in order of estimated value, were: Geoemydidae (27%), Pythonidae (23%), Testudinidae (19%), and Emydidae (15%). The majority of trade in Geoemydidae was in two species: Mauremys reevesii and M. sinensis. The majority of the economic value in live reptiles was derived from captive-bred specimens (81%). Although the relative value of an individual live bird imported to the EU appears to be comparatively high, trade volumes are low. The overall value of live bird imports in 2012 accounted for USD0.9 million (~EUR0.67 million) or around 3% of the estimated value of EU imports of live animals. The majority of the value can be attributed to birds from captive sources (88%), with only 11% of the value derived from wild-sourced birds. Over 40% of the estimated value of live bird imports in 2012 could be attributed to Falco rusticolus, all of which was captive-bred. The total value of EU imports of live invertebrates (USD7.9 million or ~EUR5.8 million) was dominated by the species of the class Hirudinoidea (USD4.7 million; 60% of the value of live invertebrates), all due to trade in Hirudo medicinalis and H. verbena. Corals of the class Anthozoa were also worth an estimated USD2.9 million or ~EUR2.1 million (37% of the value of live invertebrates). The majority of the value for live corals and leeches was derived from wild-sourced specimens (62% of the Anthozoa value and 88% of the Hirudinoidea value). Average value of live animals imported by the EU in 2012, by class (nearest USD). For the majority of plant species, the United States dataset did not have any value information that was comparable to the animal value data applied and there is no existing centralised dataset for global plant price data. Where data is available, it is possible to complete ad hoc analyses for trade in individual species using the same methodology as described for the United States dataset. For example, based on price data acquired by Guatemalan customs and provided by the CITES Management Authority for the years 2009-2013, the value of live imports of Cycas revoluta (all of which was artificially propagated) to the EU in 2012 was estimated at USD1.85 million (~EUR1.37 million). This was the fifth highest taxon imported by the EU in 2012 by value, and comprised 3% of the volume of all live plant imports as reported by number. Analyses of only a very limited selection of timber parts and derivatives have previously been possible (see 2011 Analysis). The value of CITES-listed timber to the EU is likely to be high given, for example, the median value for Swietenia spp. (USD1856/m3 in 2011 or USD1894/m3 in 2012, correcting for inflation). Considering that 70 000 kg and 71 000 m3 of timber (all species) was imported to the EU in 2012, in addition to over 74 million live plants, 1.3 million kg of wax, almost 600 000 kg of bark, and almost 330 000 kg of extract, the overall value of EU plant imports is likely to be substantial. Efforts continue to acquire more comprehensive price data for CITES-listed plants. Total 2012 import value based on family median value by class, divided by the number of animals imported in 2012 by class. As in 2010 and 2011, caviar extract represented the main commodity in trade by value in 2012, amounting to USD3.8 billion (~EUR2.8 billion). This commodity is imported in very small quantities, and is used in cosmetics, luxury moisturising creams and skincare preparations for its purported anti-aging properties. According to the United States Customs data, the estimated value of one kilogram of caviar extract is USD22 million (~EUR16.2 million) or USD22 000 per gram. This is based on the median value of 432 records within the United States Customs dataset, spanning five years (2008-2012) and involving both United States imports and exports. It is unclear whether the declared prices in the United States dataset represent the actual price for the extract in its natural form or whether this value represents the luxury commodity that contains the extract; however, caviar extract is known to be traded internationally in both forms. In total, nearly 171 kg of extract were imported by the EU in 2012 from a variety of sturgeon species and hybrids. Virtually all extract (99.8%) originated from captive-bred or captive-born sources, with the remainder ranched or of unreported source. Switzerland was the main EU trading partner accounting for 98% of EU imports; however the majority of this extract originated from two EU countries; France (56%) and Italy (43%). Therefore, when caviar extract is included, the total value of CITES-listed animals and animal products imported by the EU in 2012 was estimated at USD4.5 billion (USD4 559 978 422 or ~EUR3.3 billion). Corrected for inflation, this is an increase of 23% compared with the equivalent 2011 estimate. Quantity and estimated value of caviar extract (in kg) imported by the EU in 2012 (rounded to two decimal places, where applicable). Based on importer-reported trade volumes and estimated commodity values, Switzerland was considered the main trading partner by economic value in 2012, with imports from the country estimated to be worth approximately USD235 million or ~EUR174 million (animal commodities only, excluding caviar extract). Trade with a further eight countries was estimated to be worth USD15 million-USD75 million each, with the overall import value from all other individual trading partners being worth less than 2% each. Estimated value (2012 USD) of EU imports from the top trading partners by value in 2012, with an indication of the combined value of imports from the remaining 122 trading partners (“Other”). Considering the live animal trade only, the key trading partners by value were Mauritius (24%), Turkey (15%) and China (10%). This is in contrast to the live animal trade by volume, where Indonesia, Australia and the Russian Federation are the main EU trading partners. Of the wild-sourced and ranched trade imported directly to the EU in 2012 (totalling USD424.7 million), ten export countries accounted for 91% of the estimated overall value of imports. In the CITES context, this trade is likely to be economically important to these countries. Six of these countries are one of the 17 “megadiversity” countries, three of which have over 1000 CITES-listed animal species; United States (1097), Indonesia (1460) and Australia (1061). Estimated value (2012 USD) of wild-sourced and ranched EU imports in 2012 (*= “megadiversity country”). 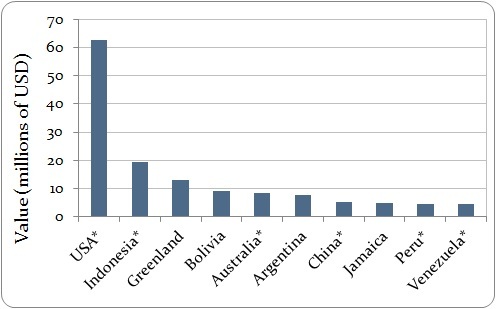 However, whilst the EU imported over 100 different taxa from coral-rich Indonesia and Australia (with corals representing 8% and 10% of CITES-listed animal taxa within these countries respectively), estimated total values from the remaining “top ten” countries could be attributed to ≤ 20 taxa. Bolivia, China, Jamaica and Venezuela each exported only one wild-sourced or ranched species to the EU in 2012 (representing <1% of the CITES-listed animal species in each country). Whilst Greenland has relatively few CITES-listed animal species (35), over 30% of these were imported by the EU in 2012. Half of the estimated overall value of captive-bred trade imported directly by the EU in 2012 was from Switzerland; 97 taxa were imported from the country but over 99% of the value was derived from trade in Acipenser baerii. Other notable trading partners for captive-bred imports by value were Viet Nam (9% of captive-sourced value), China (8%), Zimbabwe (7%) and South Africa (6%). Relatively few taxa accounted for this value from China (15), Viet Nam (7), and Zimbabwe (1); whilst EU imports of 51 taxa originated in South Africa, almost 98% of estimated value was derived from Crocodylus niloticus. Mittermeier, R.A., Gil P.R. and Mittermeier, C.G. (1997) Megadiversity: Earth’s Biologically Wealthiest Nations. Conservation International, Cemex. The monetary value of EU-reported CITES-listed animal exports in 2012, excluding caviar extract, is estimated to be approximately USD1.2 billion (USD1 236 904 240 or ~ EUR913 million). This is around 70% higher than the estimated value of EU imports in the same year. Reflecting high volumes of reptile exports in 2012, this group accounted for 84% of the overall value of exports (over USD1 billion). Whilst the estimated economic value of birds imported into the EU is relatively small, the value of exports of birds and their parts and derivatives was worth over USD78.5 million (~EUR58 million) in 2012. EU exports of wild-sourced and ranched CITES-listed animals accounted for USD666 million (or ~EUR492 million; 54% of total estimated value), with captive-produced exports worth over USD527 million (~EUR364 million, or 43%). Proportion of EU value (2012 USD) of (re-)exports of animal products by class in 2012. The proportional value of key commodities exported by the EU in 2012 is summarised in the figure below. As for EU imports, leather products (encompassing both small and large leather products) were the top commodity exported. The overall value of exports was largely comprised of luxury items: leather products (76%), garments (6%) and caviar (3%). The main destinations for EU exports by overall value were: Switzerland (36%), United States (16%) and China (13%). A brief overview of the top two export commodities is provided below. Value (2012 USD) of trade for the top five commodities (re-)exported by the EU in 2012 (excluding caviar extract), with an indication of the combined value of the remaining terms (“other”). Leather products were the most valuable commodity exported by the EU in 2012, worth an estimated USD935 million (~EUR690 million). As a comparison, exports of leather products were worth three times the value of imports of this commodity, and over four times the value of skins imported in 2012. The EU leather industry creates high-added-value products in the fashion, furniture and automotive sectors. The EU itself is the main consumer of the leather it produces, absorbing two-thirds of leather sales. The total annual export value of CITES-listed leather products manufactured in the EU is therefore likely to be substantially higher than USD935 million. The main EU exporters of CITES-listed leather products by estimated value were Italy (52%) and France (30%). The top import destinations (according to highest estimated value) were Switzerland (45%), United States (15%) and China (15%). Live animals were the second most valuable commodity exported from the EU in 2012, accounting for 7% of export value, worth an estimated USD89 million (~EUR65.7 million). Compared with the volume and value of EU live animals imported (one million animals, worth around USD24 million), export volumes were much lower (just under 400 000 animals), but overall value was estimated to be over three times higher (USD78.6 million, ~EUR58 million). In contrast to EU live animal imports, export value was dominated by birds, with 83% of the overall value being attributed to this group. Live exports of Hirudinoidea (all Hirudo medicinalis and H. verbana) were worth an estimated USD11.6million (~EUR8.6 million). Proportion of EU value (2012 USD) of (re-)exports of live animals by class in 2012. Over 130 000 live birds were exported from the EU in 2012. The approximate average value of a live bird (based on estimated family median values) was USD555. 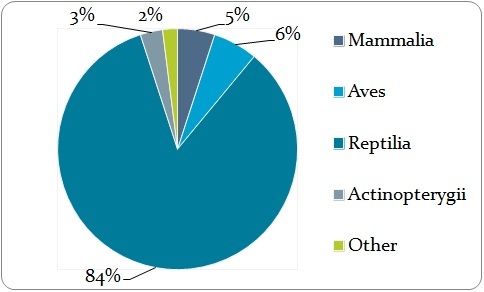 Virtually all of the value (>99%) involved captive-bred birds, with the main genera involved being: Agapornis (42%), Falco (14%) and Platycercus (13%). Both Agapornis spp. and Platcercus spp. are non-native to the EU. The Netherlands was the main exporter of live birds by overall estimated value in 2012 (48%). The top importers by value were: Indonesia (39% or USD31 million), which was the main destination for Agapornis spp. ; United Arab Emirates (17% or USD13 million), being the key importer for Falco spp. ; and Kuwait, Jordan and Pakistan, each accounting for around 4%. Average value of live animals (re-)exported by the EU in 2012 by class (nearest USD). Live mammal exports were estimated to be worth USD2.1 million (~EUR1.6 million) in 2012. 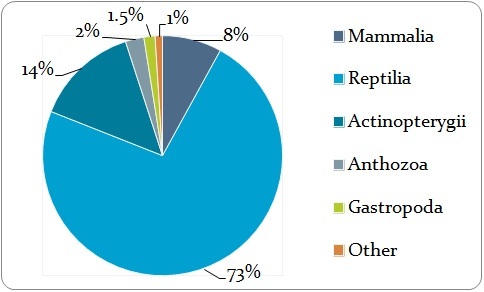 The families Cercopithecidae and Cebidae represented the most valuable live mammal exports in 2012, representing 33% and 29% of the overall value of this group, respectively. Virtually all were captive-bred. Whilst there were 53 importers of live mammals from the EU, the main trading partners by estimated economic value were the United States (15%) and China (14%). Exports of live reptiles from the EU in 2012 was estimated to be worth USD1.5 million (~EUR1.1 million). The key reptile families in order of estimated value were: Testudinidae (31%), Chamaeleonidae (27%) and Pythonidae (26%). The majority of the economic value in exported live reptiles was derived from captive-bred specimens (97%). The main EU trading partners by economic value were Hong Kong, SAR (22%), United States (21%) and Japan (16%). EU exports of garments in 2012 were worth an estimated USD77.8 million (~EUR57.5 million), with 62% derived from reptiles and the remainder mammals. Skin exports were estimated to be worth USD41.5 million; over 85% of the value of skins exported from the EU (around USD35.9 million or ~EUR26.5 million) were also reptilian, mainly Alligatoridae and Pythonidae. Caviar exports were worth an estimated USD30 million (~EUR22 million), with over 98% being from captive sources. Total 2012 (re-)export value by class, divided by the number of animals (re-)exported in 2012, by class. As for imports, caviar extract was also the main commodity exported from the EU by value in 2012, amounting to USD91.6 billion (~EUR68 billion). Over 4100kg of this commodity was exported from the EU in 2012, which is estimated to be worth USD22 million per kilogram according to United States Customs data. Virtually all was captive-bred (>99.9%) and mainly originated in Italy (51%) and France (46%), with virtually all exported by France. The United States and Switzerland were the main importers by value (68% and 20% respectively). Over 97% of the value of the exported caviar extract was derived from Acipenser baerii. This species is native to China, Kazakhstan and the Russian Federation. Billion” in this report is used to refer to 109. Whilst all 27 Member States exported animal commodities in 2012, eight countries accounted for over 95% of the overall estimated export value, excluding caviar extract. These were, in order of estimated economic importance: Italy, France, Austria, Portugal, the United Kingdom, Germany, Netherlands and Spain. Trade in live animals was the most valuable commodity exported by the Netherlands and the United Kingdom, whereas leather products accounted for the main value for the remaining six countries.